Socializing continued today after church, with Evelina welcoming her sister-in-law Henrietta Williams Gilmore and a mutual friend, Mrs Stevens, back to the house. She and the latter went to call on Col John Torrey while the Ames sons rode south to Dr. Caleb Swan’s to call on a Miss Eddy, who must have been special to warrant all three boys coming to visit. Not forgetting that the Lothrop family had just been through the loss of Sarah Ames’s brother Clinton Lothrop, houseguest Pauline Dean called on young Helen Angier Ames, niece of the deceased. Evelina was certain that Pauline only went to talk about a new love interest, however. Oliver Jr and Sarah Ames, meanwhile, went with another brother, George Van Ness Lothrop, and his wife Almira to call on their parents and their brother’s widow. George Van Ness Lothrop, a North Easton son who had moved west a decade earlier, was, in 1851, serving his adopted state of Michigan as State Attorney General. Active in Democratic politics and a general counsel of the Michigan Central Railroad for nearly three decades, he ran unsuccessfully for U.S. Representative and U.S. Senate. He was a great supporter of Stephen Douglas, which would certainly have put him at odds with his brother-in-law, Oliver Jr., who was a Lincoln man. In 1885, he was appointed by Grover Cleveland to be U.S. Minister to Russia. He died in 1897, and was honored with a road in his name in Grosse Pointe, Michigan, just outside of Detroit. Evelina certainly did her part. With her friend Pauline Dean, she paid calls on various friends, including the Howards, the Dunbars, and the dependable Reverend Whitwell and his wife Eliza. At her brother Alson’s farm, where they took tea and visited with old Mrs. Gilmore, they chatted with three daughters of the John Pool family, including Rachel, Augusta and Elizabeth. Rachel and Augusta had visited Evelina earlier in the month and accompanied her to the company store and the shovel shop. Evelina was a friend to young women – especially to Orinthia Foss, the schoolteacher, whom they scooped up and took back to North Easton. 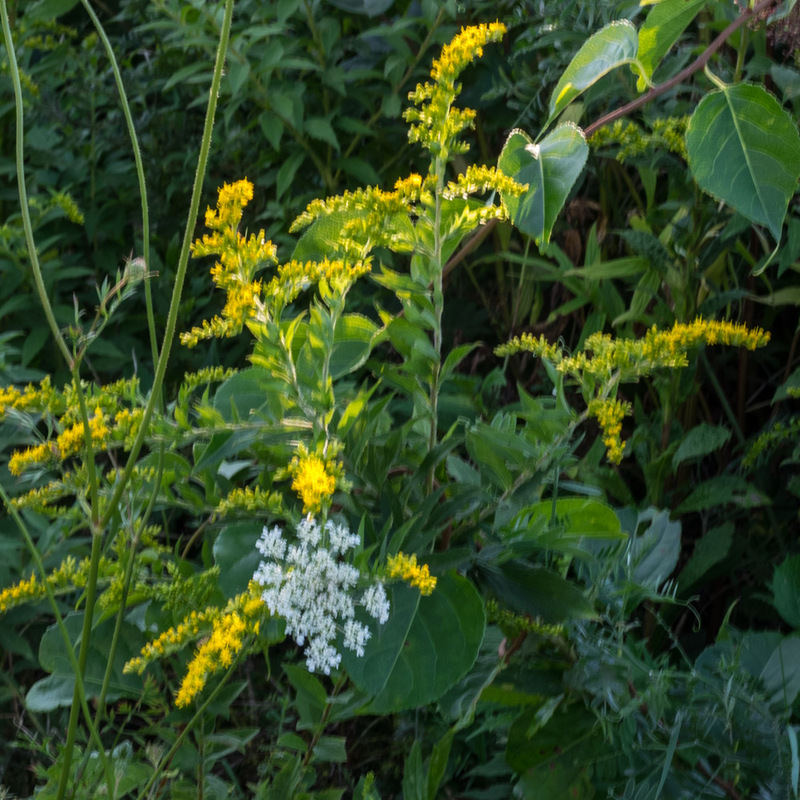 On their way home, as they likely rode past fields of Queen Anne’s Lace and Goldenrod, did they acknowledge that summer was coming to an end? ** Marc McCutcheon, Everyday Life in the 1800s, Cincinnati, 1993, p. 200. The day after Clinton Lothrop’s funeral, Sarah Lothrop Ames, her brother George Van Ness Lothrop and his wife Almira spent the day, at least, at the Lothrop farm with their parents, Howard and Sally Lothrop. They would have had to make long-term plans for the property, now that Clinton wouldn’t be there to tend the family farm. Alson Gilmore, Evelina’s brother, took his meals at the Ames’s today. He was working nearby, perhaps with Mr. Hall, helping his son, Edwin Williams Gilmore, build a house. They were putting in the cellar. Pauline Dean, who must have been staying with or near the Gilmores, returned for a visit. She probably got roped into helping Evelina with the mending. 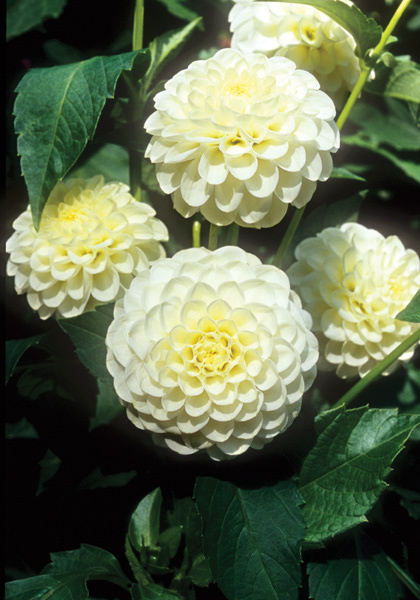 Dahlias, which had been introduced in the United States early in the 1800s, had quickly became popular, although not yet listed in Joseph Breck’s Book of Flowers. So successful were they that over the course of the century more than 10,000 varieties were developed or identified and sold. Today, dahlias are still much admired by flower gardeners, yet less than a dozen of those 19th century heirloom examples still exist in cultivation. * The earliest known, White Aster (above) dates from 1879. Thursday Aug 28th Have done but very little sewing to day. There was much socializing in North Easton today, but it paled in importance when compared to the departure of Frederick Lothrop Ames for college. 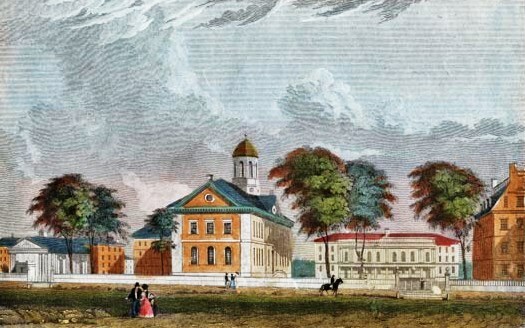 Though only 16 years old, Fred was entering Harvard College as a sophomore, making him a member of the class of 1854. “[A] fair, cool day,” Old Oliver noted in his journal. “Clinton Lothrop buried.” Brother of Sarah Lothrop Ames, a young husband, father, and farmer, Clinton had died of typhus fever. Evelina helped Sarah, Clinton’s only sister, place a shroud on the corpse. In the afternoon, with her husband and family, Evelina attended the funeral service, which would have been at the Lothrop home, and the burial. Clinton was buried in the new cemetery. Despite the somber events of the day, Evelina managed to brighten her home with flowers from her garden. In the evening, her nieces Abby and Malvina Torrey made a call with their relative, Mrs. Fullerton. Malvina wore a “bloomer hat” that Evelina had given her. 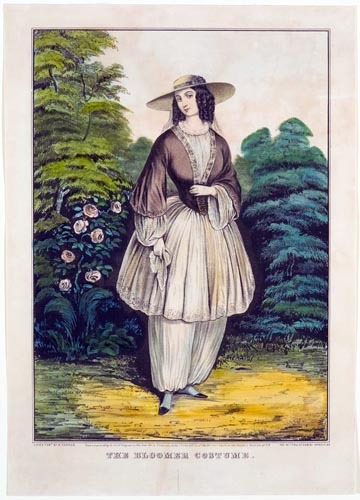 The bloomer costume – seen above in the Currier print – was a fashion phenomenon in 1851. Originally developed by readers of a health publication called The Water-Cure Journal, “Turkish pants” were touted as a healthful alternative to the heavy-skirted dresses and constrictive bodices that women typically wore. They became known as “bloomers” when Amelia Bloomer of Seneca Falls, New York, told the readership of her temperance periodical, The Lily, that she had adopted the style to wear. She published instructions for making the outfit, and the curious style became a craze. Although the bloomer costume was admired at first as being healthful, it soon became politicized as women’s reform became prominent in the headlines. To many, the free-flowing bloomers became symbolic of the suffrage movement. Publications that initially praised bloomers recanted as the outfit became more controversial. The fashion held its own through the decade, however, but disappeared after the Civil War, only to revive in the 1890s. Evelina, sewing maven that she was, had been following the fashion news, but hadn’t opted to make a bloomer costume for herself. With a nod to the trend, however, she acquired a bloomer hat, probably like the one in the Currier print, to give to her ten-year old niece, Malvina. Dewitt Clinton Lothrop finally died. He had been suffering from typhus, “an acute infectious disease caused by the parasite Rickettsia prowazekii, transmitted by lice and fleas [,and] marked by high fever, stupor alternating with delirium, intense headache and dark red rash.”* It’s not the same disease as typhoid fever, although the two conditions have some similarities. Clinton, as he was known, had probably been bitten by a flea. One of nine sons of Howard and Sally Lothrop, Clinton was a brother of Sarah Lothrop Ames. While most of his surviving brothers had moved away from Easton in pursuit of their own lives, Clinton was the duty son who had stayed home with his parents. Only 26 years old and married with two small sons, he had tended the family farm. Evelina and Sarah Witherell quickly prepared a shroud for the body, while Harriett Mitchell rode off to Taunton to find mourning clothes for the young widow, Elizabeth Howard Lothrop (or for the mother, Sally Williams Lothrop.) That no one had purchased the mourning clothes before now suggests that, despite the probability of death, everyone had hoped that Clinton would recover. It was a busy day for Evelina. Besides helping sew the shroud, she saw her friend Pauline Dean depart to visit elsewhere in Easton and welcomed her brother Alson to midday dinner. Alson was working nearby, helping his son, Edwin Williams Gilmore, build a house. Jane McHanna washed clothes, and she and Evelina probably continued to set the house to rights after a weekend of guests. 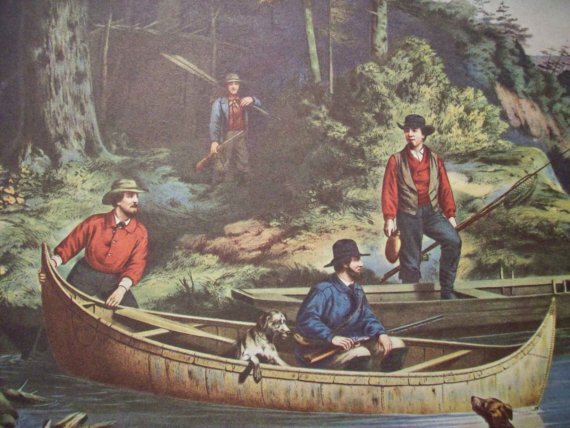 Oakes Angier and Frank Morton returned home from their fishing trip. and Frank on their way fishing. Alson dined here. Another Monday and for the second time that summer, washing day got deferred. Tidying up from “having so much company” took precedence over routine. The young relatives, Jerry and Warren Lothrop, left in the morning. Another visitor, Pauline Dean, remained. Oakes Angier and Frank Morton Ames left to go fishing, a trip they had deferred from last week. They had waited then for the imminent death of Dewitt “Clinton” Lothrop, which hadn’t happened. Clinton, though deathly ill with typhus, was hanging on. The boys decided to wait no further, and departed. Evelina and “We Ladies” – which could only mean Pauline and probably niece Lavinia – went to see Col. John Torrey in the village and called on Elisha Andrews at the boot factory. Elisha, who was 27 years old and single, had started up the factory with Augustus Gilmore and Oakes Angier Ames. In recounting the visit to the boot shop in her diary, Evelina underlined Elisha’s name. Why? 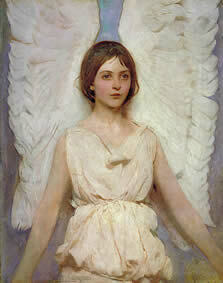 The visit was significant in some way; perhaps one of the women – Lavinia? – was romantically interested in Elisha. More socializing continued late in the day when the Kinsley family visited. Lyman Kinsley, his wife Louisa, daughter Lucy Adelaide and a Miss Billings (a niece of Louisa, most likely) came for tea. Mr. Kinsley ran an iron and machine shop in Canton, an enterprise that the Ameses would eventually own. After tea, they all walked over to the factory.